I read The Primal Blueprint by Mark Sisson, while on vacation on the west coast, and found deep satisfaction and a renewed energy from beginning to implement some of the principles into my daily habits. The main theme of the book is to reconnect with the lifestyle of humans from 10,000+ years ago when we were at our evolutionary prime. If you don’t understand why that was our evolutionary prime, read the book or read my summarized explanation in last week’s post on Nature -vs- Technology. Most of these are self-explanatory, although the book shares some interesting science and research on each law. I’m going to focus on just the few that I’ve begun to implement: #1, #3, #4, and #5. There should be no surprise that the first few I chose focus on eating and training. I am experimenting with a few others, but I find it’s easier to establish 1-2 habits at a time instead of a handful or more. This week I’ll cover just the principles behind Primal eating. Primal Law #1 is: Eat Lots of Plants and Animals. The concept is very similar to the Paleo diet I described in a previous post. 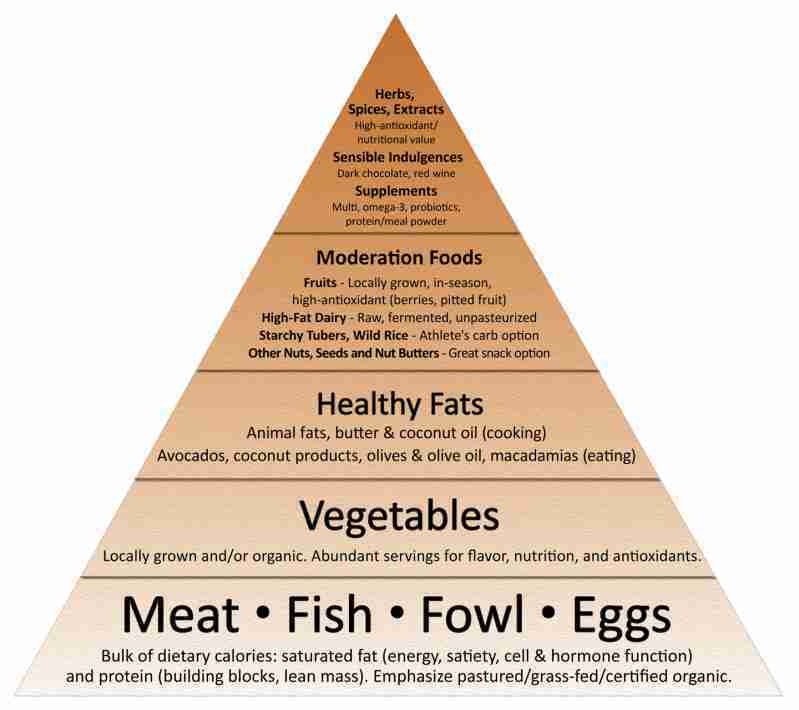 You can’t have a proper eating regimen without a triangular visual representation, so sere’s the Primal eating pyramid. The author isn’t very strict about much in this eating regimen, but the fundamental change is eliminating grains and sugars. Our bodies have not adapted well to processing large amounts of carbohydrates, since carbs were much more scarce 10,000+ years ago. The concept here is not eliminating carbs. It’s focusing on the best balance of nutritious food that aligns with our evolutionary history. Fruits and especially vegetables are encouraged, but be careful about overeating fruit. This wasn’t a problem in the caveman days, but we could easily overindulge in fruit today. Eliminating grains and sugars will keep your blood glucose much more stable. When your blood glucose is stable, you’ll release less insulin, which clears glucose from your bloodstream and transports it into cells. It also promotes fat storage, so limiting insulin in your bloodstream helps turn your body into a fat-burning machine. The author describes some research showing that there are a few different optimal level of daily carbohydrate ingestion based on your goals. 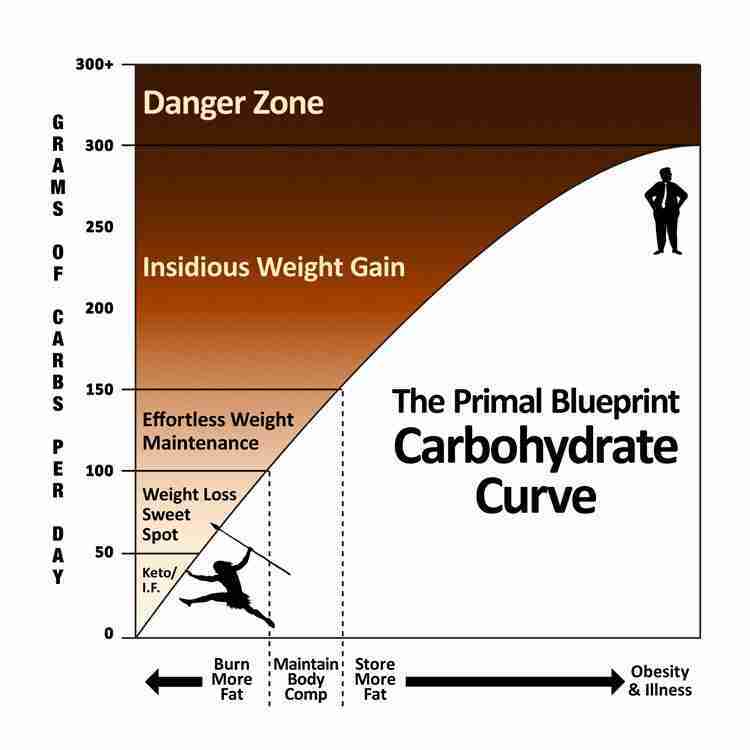 If you want to lose weight, you’d target eating under 100 grams of carbs per day. If you’re in maintenance mode, you’d aim for under 150 grams. Here’s a graphical representation. You might think this will be difficult. IT IS. Sugar and grains are a primary dietary source of calories for most of us and society promotes the advantages of eating whole grains. I’m convinced that “advantages” are not nearly as strong as the Primal/Paleo style of eating. If you want more details on this, read the book or ask me in person. I have a continuous glucose sensor that reads my blood glucose every 10 seconds and plots it on graph over a 24-hr period. My blood glucose values are now generally stable all day long as you can see in this PDF by focusing on the Glucose chart. Previously, I would have dramatic swings from high to low blood glucose and had to eat every 3 hrs to calibrate my system with the right amount of glucose and I’m considered a well-controlled diabetic by almost any doctor. You can see what a typical day was like for me previously by opening this PDF and focusing on the Glucose chart showing the rapidly changing blood glucose with lots of highs and lows. You might think that your body wouldn’t react this way, since you’re not a diabetic. You’re wrong. It does react the same way except that your highs will be less high and your lows will be less low, since insulin and glycogen release is handled automatically for you. Your body will still need to release massive amounts of insulin when ingesting sugar and grains in any normal quantity and your energy level will still dip substantially 1.5 – 3 hours after you eat like this. You won’t know abou the insulin release like I do and you may or may not make the connection that your waning energy level is related to what you ate a little while back. What do you eat if you’re not eating sugar and grains? FAT. Remember, fat does not make you fat as this post describes. You can eat eggs with yolks, butter, chicken with the skin on, full-fat cheese, and on an on. I’ve added a lot of coconut oil, avocado, almond butter, and regular butter to my meals and I feel full for hours. Fat has a satiating effect that sugar and grains just can’t replicate. Add some butter to your vegetables and they’ll taste better and you won’t be clamoring for a sugary treat afterwards. This is a difficult change to make as any worthwhile change typically is. The author recommends trying it out for 21 days. I recommend trying it for just 7 or even 1. I felt better immediately and both my wife and I noticed a big difference after just a week. We had a lot more energy to devote to our daily activities and my focus was much more intense during those activities, since I didn’t have cravings for food or rapidly changing energy levels. That’s it for the Primal eating philosophy. Next week I’ll cover the training principles next week and how you can get fit in as little as 3 hours per week in Part II.